I hope my absence this week hasn't left anybody thinking we'd fallen foul to killer sheep or been swept off the edge of the Pontcysyllte aqueduct, but if you have been a tidgy bit worried, let me assure you that we're safe and well and had a wonderful time in beautiful Llangollen. If any of you live within reasonable hitting distance of North Wales and have yet to visit Llangollen, I suggest you remedy that as quickly as your car will carry you. 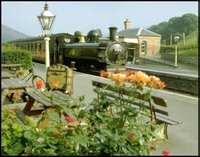 I'd suggest the train as an alternative, but the only train from the local station is a steam train running an 8 mile length of track to Carrog, a tiny village where stepping onto the station is like stepping back into the Victorian era. What a wonderful place for a writer! I can honestly say that, so far, of all the places I've visited in the UK the area around Llangollen has to be the prettiest yet! One day, when I'm a disgustingly wealthy author of several best sellers, we'll buy a house there. We were sad to have to come home on Tuesday, another day at least would have been nice, especially with the weather being so good, but knowing we had the NWG meeting to look forward to in the evening helped. Iona and Penny had both arranged to surprise us with champagne. What lovely ladies! Iona hasn't actually started blogging on her NWG blog yet but if you nip over to Scribe's Sanctuary you'll find her posting as Imogen (her pen name). I usually have smoke coming out of my fingers during the days immediately following a writers' group meeting but this time I've written the grand total of zero words. Yepp 'Tis true. Nothing. Zilch. Absolutely jack all! Not a single word. I've been busy with my accounts, y'see. I'm one of those people who puts off doing the boring stuff and then regrets it when she's bogged down with it at a later date. Three solid days I've been at it. Downloading and printing out bank statements and online invoices, printing my local invoices, finding all those old till receipts, and getting it all into some kind of order and putting the numbers into the spread sheet! And I'm still not finished! It's all gotta go to the accountant next week because my daughter's EMA rides on my being below the £35,000 income threshold and I'm blowed if I'm going to have her miss out on that. The state give me a piddling £45.70 a week for looking after my adult son 24/7 so I'm taking what I can get elsewhere! Call me a money-grabber if you like; I don't care, but I'm tired of being taken the piss out of by this government! You've reminded me too that I have to get our accounts done. There's so little time for everything and writing often seems to take last place, which is s-o-o frustrating. My son has severe learning difficulties and after living in Norway where these things happen more or less automatically, I couldn't believe the hassle a person's put through in order to receive any kind of help. Three doctors had to test him to make sure he really is retarded (30 seconds in his company is really all that's needed for anybody to know that!) and mounds of paperwork. No, don't get me started either! I know what you mean about writing tending to come last; it doesn't look as if there's going to be much time for writing during the weekend, either. I've got to take my daughter to have her nose pierced now, then we're going to a barbie tonight and tomorrow's booked by clients whose copy I should have written last week while I was doing the accounts! Oh well... you make your bed... and rather this than a 9-5 job! Glad you had a wonderful break. You're not money grabbing at all. I've had experience with those mounds of paperwork our Gov try to drown you with, and it's a nightmare!